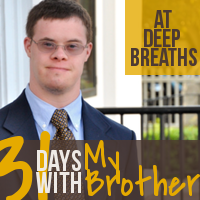 Welcome to Day #4 of 31 Days with My Brother! I thought we’d take a break from the medical challenges that my brother has experienced and give you a picture of the love my sisters and I have for our brother. Today I am going to share a story that I wrote in elementary school about Brian to give you a taste of my fierce loyalty for this one-of-a-kind guy. *I left in my typos and mistakes so you could get a better feel for the authenticity/age of my story. However, I did edit punctuation so it would flow better. It all started when Brian my brother was born at 2:30pm, May 24th, in the laper labor room. My mother was crying. Well hears the story…my brother was not a relger regular brother, you see he was handycaped handicapped. My mother did not tell me about it atill until she brought Brian home. It is hard for me now, but then I don’t think it was hard, because I really did not unerstand understand then. And some people still don’t understand. I remeber remember the first time are our family went to J.B. Park and the zoo. We went to the zoo first, then the park. And walked away to the car. Now Brian is smarter than me because he can spell Phenix Pheonix, can you? And he can spell push, cook, stop and Brian and with some help, Pannasonet Panasonic; I can’t. P.S. Cari and Sarah (my childhood friends) think he’s cute. I love that comment. I don’t think he’s too different, do you? Deep Breaths: Family is a gift. No matter what your family is like I hope today you will take a moment and love on your family (a card, text, e-mail, visit). Just something to say thanks and I appreciate you. No family is perfect, but God’s sacrificial and unconditional love can indeed hold it together. “17 He (Jesus) is before all things, and in him all things hold together. 18 And he is the head of the body, the church; he is the beginning and the firstborn from among the dead, so that in everything he might have the supremacy. 19 For God was pleased to have all his fullness dwell in him, 20 and through him to reconcile to himself all things, whether things on earth or things in heaven, by making peace through his blood, shed on the cross. 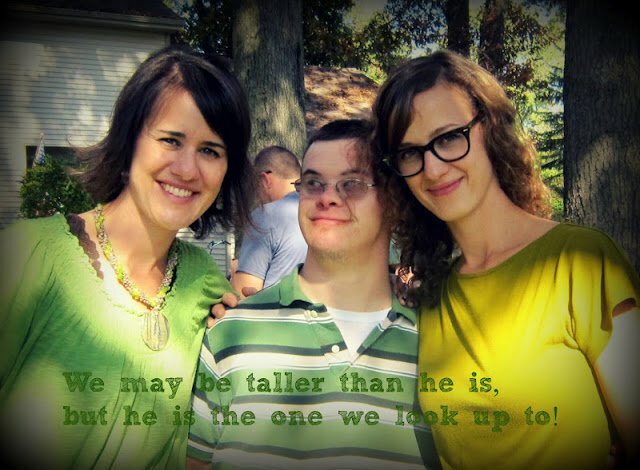 As a person who has grown up my whole life with a down syndrome cousin, I can totally relate to your stories. My cousin Donna, is 42 years old (they didn't think she would live past 3) and we have never treated her any differently than any of my 30 other cousins. She has taught me so much in my life about love, loyalty & respect for others. I am grateful also that my children have some one like her in their lives to teach them to be respectful to all people regardless of their situations. I look forward to reading your post and getting to know your brother! I am enjoying your brother's story. I was just explaining to my 17 yo daughter today about Down Syndrome as some friends of hers in her string quartet have a younger sister with some sort of birth defect(haven't met her myself and am unsure if she has cerebral palsy, Down Syndrome or some other issue). I love the simple way you present his story with scripture and something to think about. This was so sweet and brought tears to my eyes–your brother is blessed to have a sister like you!